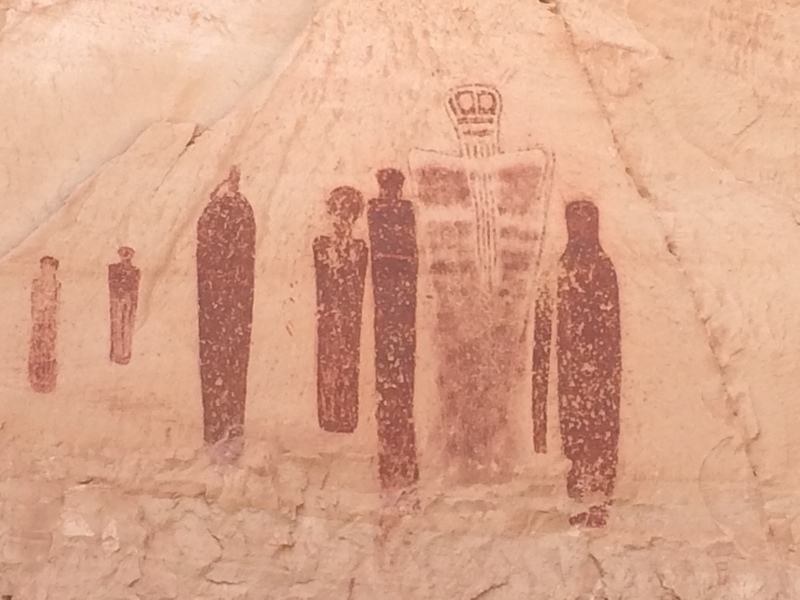 Twelve hours of driving got me to the Horseshoe Canyon District of Canyonlands National Park. I exited the truck feeling a bit shell-shocked after 2 hours of dusty back road driving following three intense weeks of teaching and little sleep. The beauty of the Canyon calmed my nerves as I hugged Teresa. Ah, I had arrived. I took a deep breath. One week of volunteer work stretched before us. 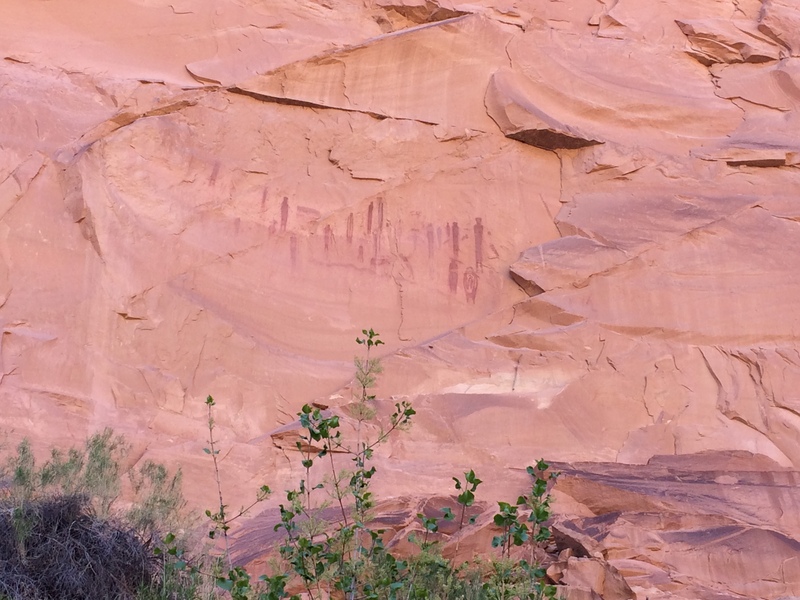 Our assignment was to be a presence in Horseshoe Canyon, monitor the rock art panels and answer visitors’ questions. The task included daily hikes of 7 miles through sand, down then back up to the canyon rim. Sunrise greeted me each morning as I looked out from my truck-bed sleeping lair. After breakfast and a bit of yoga, Teresa and I geared up and hiked down into Horseshoe Canyon. The trail to the Great Gallery descends 780 feet to the sandy Canyon floor. Flowers bloomed along the descent: Evening Primrose, Yellow Cryptanth, and Paintbrush dotted the sandstone with color. 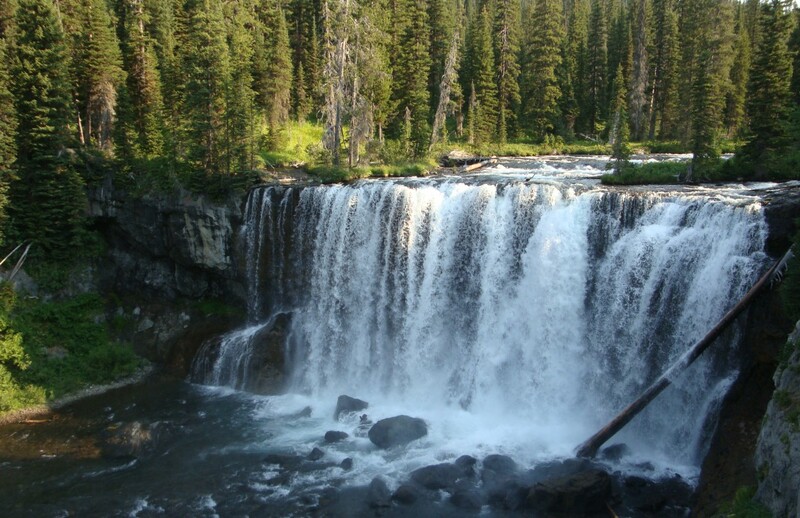 Formerly known as Barrier Canyon, Barrier Creek flows through the canyon. I use the term ‘flow’ loosely. In May, a few wet sand areas and pockets of water a few inches to a foot deep create tiny oases for plants, frogs and birds. After emptying my shoes many times the first day, I switched to sandals—at least the sand would work its way out of them. On the way in I made it a game to search out solid damp sand footing. The afternoon hike out involved trudging from shade to shade. The final morning, Teresa and I hiked separately. By now I had relaxed into ‘Canyon Time’. 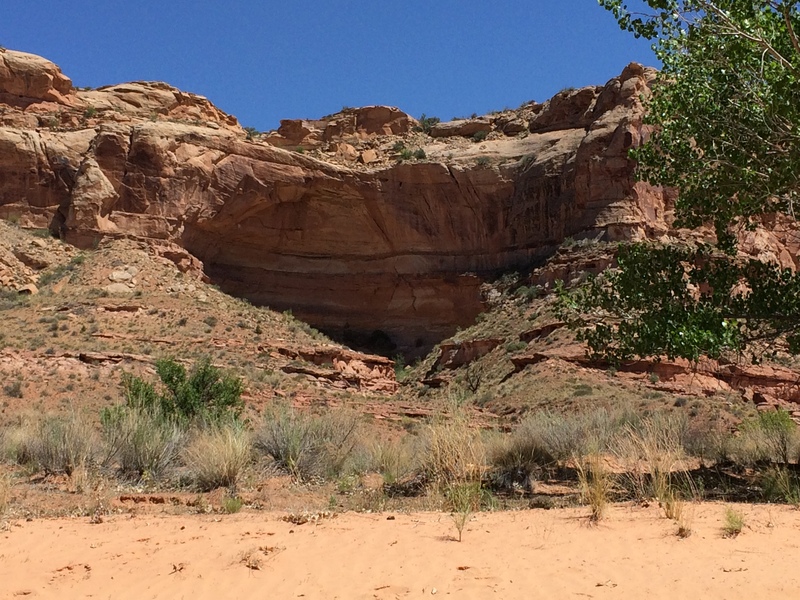 The heat made moving fast out of the question, and I slowly meandered down slickrock and onto sand. Silence surrounded me expanding my awareness. Lizard and kangaroo rat tracks crossed my trail and I stopped to peer at them more closely. The Canyon Wren sang from its favorite cliff. Moist sand wafted its slightly dank odor to my nose. Tadpoles swam in pockets of water lapping against red cliff rock. The Great Gallery shared its beauty with me if not its secrets. Sitting, staring and drawing for a week has etched the figures into my psyche, and I think of the people who created them. Nomads, moving through these canyons each year following ripening seeds and fruit, hunting bighorn sheep, rabbits, deer, leaving only charcoal from cooking fires from brief stops in each place. I wonder…. I wonder who they were, how they thought, what they enjoyed, what songs they sang, what language they spoke. If they were anything like today’s nomadic tribes in Australia and South Africa, they may have travelled many miles a year. 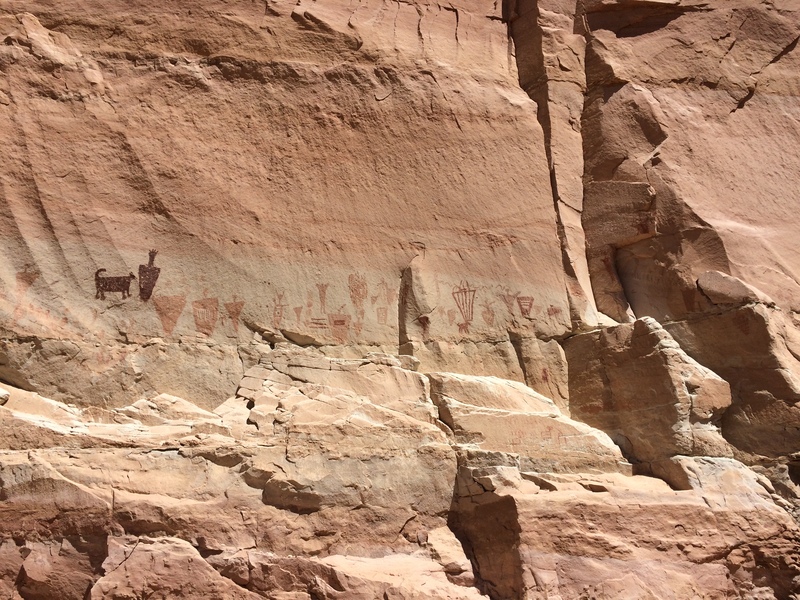 The Barrier Canyon pictograph style, which is found from the Grand Canyon through Utah and into Northern Colorado, suggests they did just that. They would not have had nor valued many possessions, and they may have only ‘worked’ a few hours a day, having more free time than most of us do in modern society. These panels are evidence of having survival needs met and having the leisure time to create art. Are these spiritual figures? 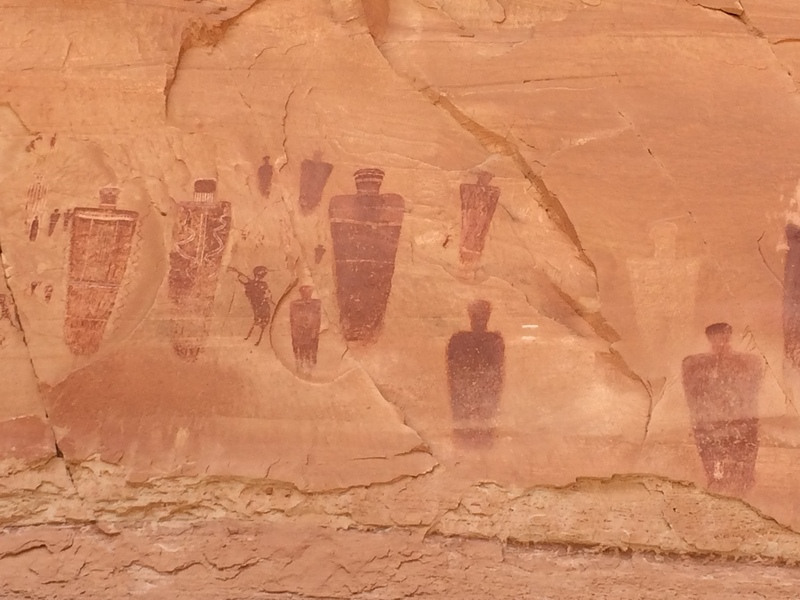 Figures of deceased individuals ascending to the afterlife or hovering above and behind the living? Are they prayers for successful hunts? Are they telling the news of who went before? We will never know, and it may be presumptuous of us to try to decipher them. The week spent with the Great Gallery figures allows me to just appreciate them and accept their mystery. As I leave the Great Gallery for the last time, I place each foot deliberately. I am one in a long line of people, extending from the distant past, walking slowly through these red rock canyons. “There has always been the wind. Since our planet began to turn, there has been the wind. This ball of dirt and fire and water started to spin. The air stirred. And Earth’s time began. This is wonderful to read, Julianne! It pops life into memories of sacred red rock adventures in Canyonlands. Thanks, John! I hope you get back down there soon. I love that canyon, there is definitely a spiritual feel to it all. You’ve captured it perfectly- putting down in writing what I’ve often felt. Thank you !!! Thanks, Teresa. It took some thinking to try to capture our experience… I loved our week together!! Thanks for sharing this cool experience. Love the photos too. Glad you enjoyed it, Diane! We’ll have to get down there together some time. Hi, lady, and thanks for this. Having just come through similar country on my way here, enjoying the wildflowers, the cross-bedded sandstone, the red rock…this makes me smile. And it took me back to Dinosaur Nat’l. Mon., where I lived and worked for roughly a year-and-a-half, met Skip, and enjoyed the petroglyphs and pictographs in that area. So long ago that time in my life. Anyway, this brought it back. Even my published (maybe out of friendship, more than for its quality) picture in one of Steve Trimble’s books of the McKee Springs petroglyph. Beautiful country…so glad you were there. Thanks, Neysa! I am glad that my words brought back a special time in your life.I so love those redrocks… can’t get enough of them. An artist, sitting in an ancient gallery, wondering, sketching, thinking about people, thinking about the very people featured in the art they left behind. I wonder, did your thoughts, the thoughts of an artist, parallel the thoughts of the artists who walked there before you? Did they share your love of land? Good questions, Mike. Makes me wonder.. and wonder some more. Though perhaps I think less about survival than they did… and i know less about the stars’ movements through the heavens, and less about the edible plants. But more about the electronics which is not particularly good.